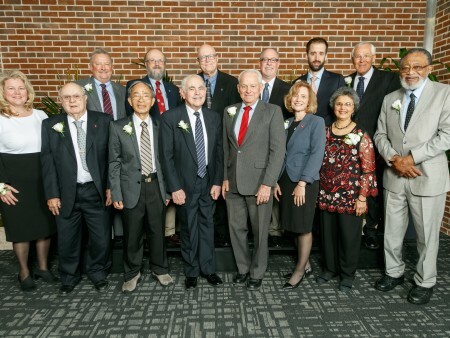 COLUMBUS, Ohio -- Congratulations to the recipients of 2018 Alumni Awards from the College of Food, Agricultural, and Environmental Sciences (CFAES) at The Ohio State University. “Each of our award recipients has increased the value and reputation of CFAES. Because of them, all of us within our community benefit,” CFAES Dean and Vice President for Agricultural Administration Cathann A. Kress told 180 alumni, relatives, faculty, staff and friends during an awards luncheon on March 3. The Meritorious Service Award is given to alumni or non-alumni who have been singularly significant in CFAES’s quest for excellence. The Distinguished Alumni Award is given to those who have brought distinction to themselves and to CFAES through their commitment and leadership. Edison Fowlks (1965, PhD, Plant Pathology), Hampton, Virgina. W. Kirk Miller (1970, BS, Agricultural Economics), Fairfax, Virginia. The International Alumni Award is given to outstanding international alumni representing, supporting and promoting CFAES and Ohio State worldwide. The Young Professional Award recognizes young men and women for their early professional accomplishments. Find additional event photos at go.osu.edu/cfaesawards2018.